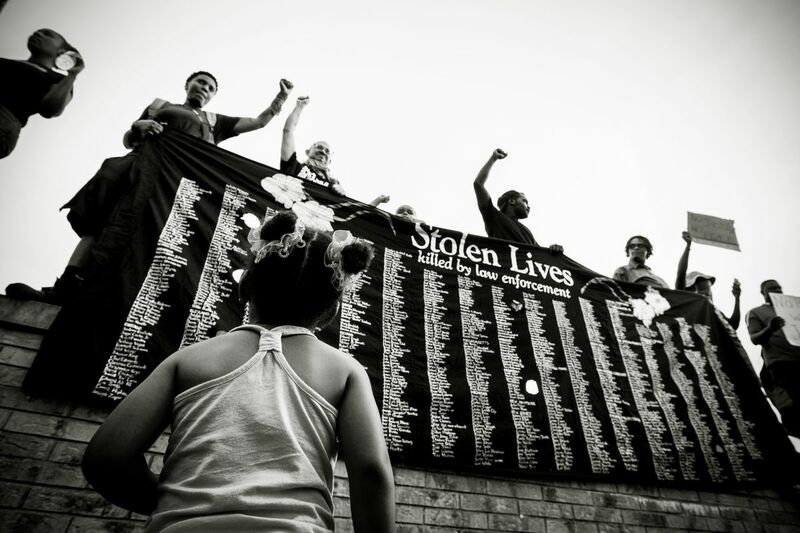 During protests after the death of Mike Brown in Ferguson, Missouri, marchers hold a banner listing the names of people killed by law enforcement since 1990. Trump has made white racial resentment more visible than it was before, but at the same time, white liberals have become much more attuned to racism — seeing more of it not necessarily because the world has changed but because their own attitudes toward longstanding features of it have changed. 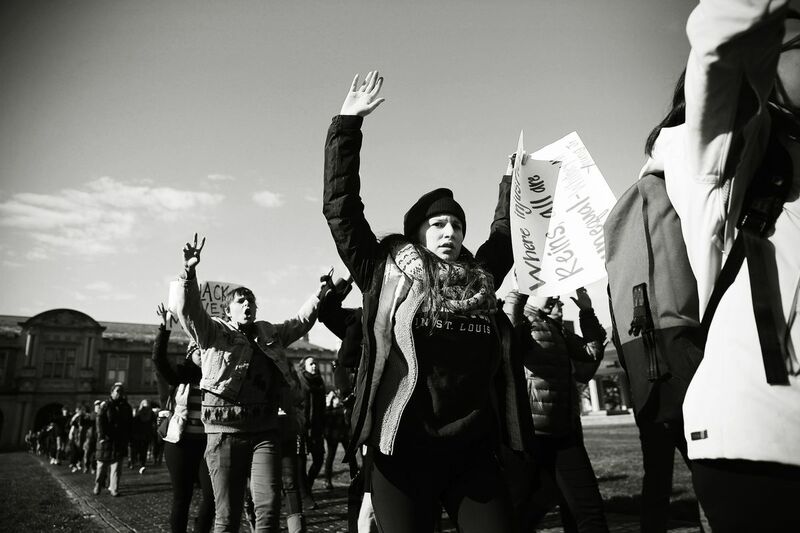 Students at Washington University in St. Louis, Missouri, protest to draw attention to police abuse on December 1, 2014. The exact implications of this for short-term electoral politics are dicey — older, more rural, less educated whites who are relatively untouched by the Awokening exert disproportionate influence in the political system. 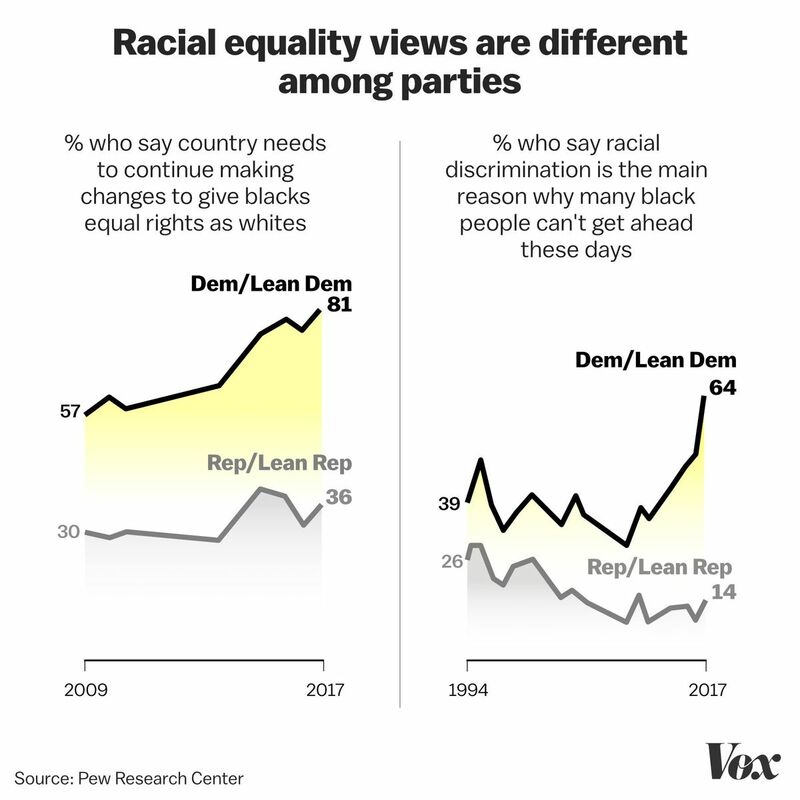 But the fundamental reality is that the Awokening has inspired a large minority of white Americans to begin regarding systemic racial discrimination as a fundamental problem in American life — opening up the prospects of sweeping policy change when the newly invigorated anti-racist coalition does come to power. The change, however, appears to predate Trump and, in fact, to have relatively little to do with the calendar of presidential politics. 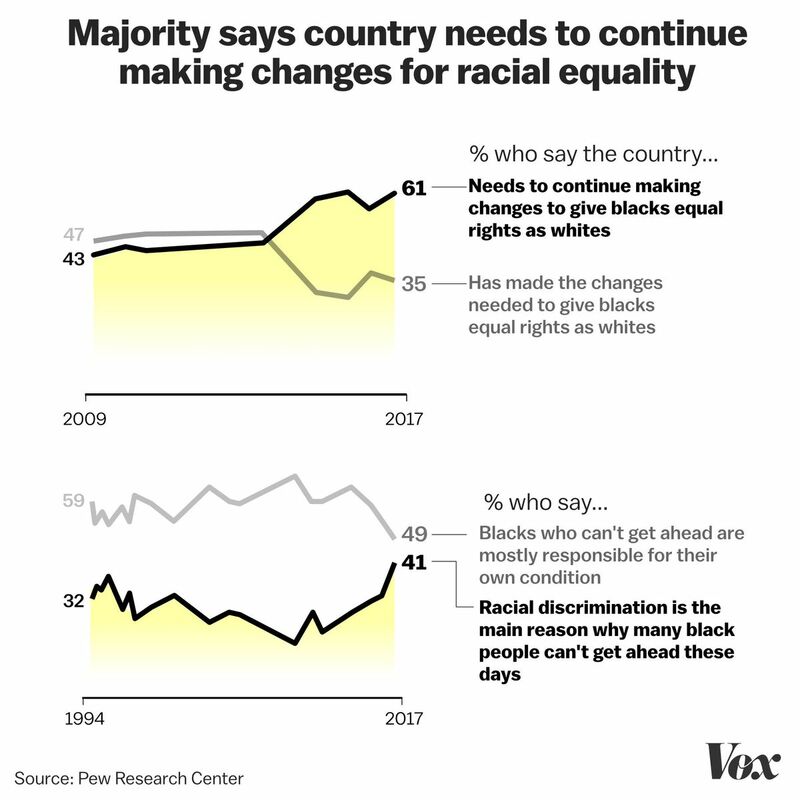 Instead, polling from the Pew Center shows that as late as 2014, most Americans believed there was no longer any need for the country to make changes to address black-white inequality. Consequently, few people believed discrimination was the main barrier to black upward mobility. 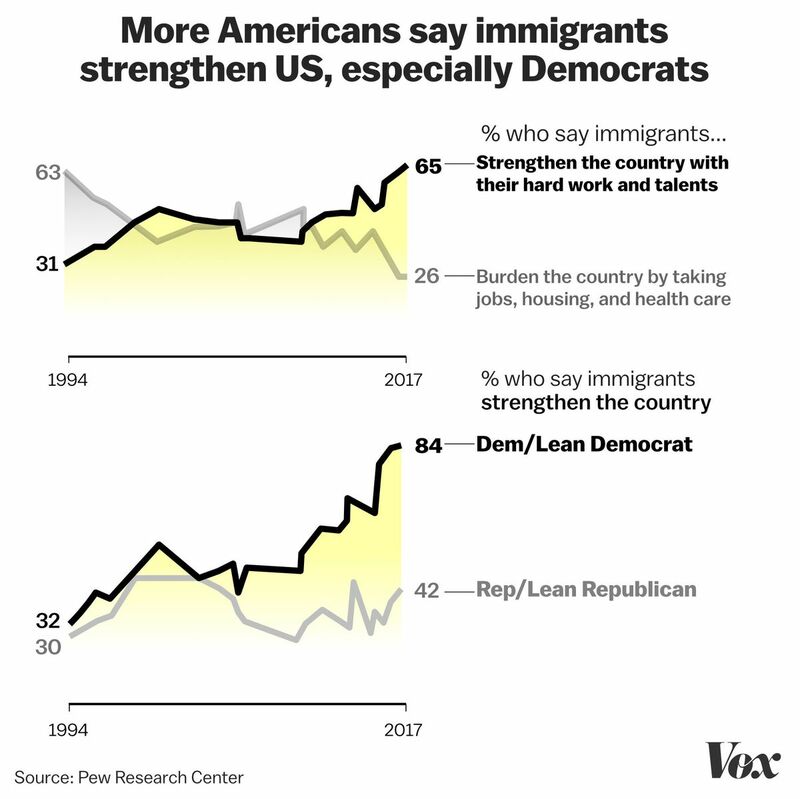 These numbers then started to change rapidly, with the shift driven overwhelmingly by a change in the views of self-identified Democrats. The extent to which that model has become mainstream among Democratic Party leaders is now evident. Just this March, Beto O’Rourke told an overwhelmingly white audience in Iowa that American capitalism is “racist.” The previous summer, Elizabeth Warren called the criminal justice system “racist.” Even Joe Biden — who in the mid-1970s was a leading political opponent of aggressive school integration measures — in a January 2019 speech called on white America “to admit there’s still a systemic racism” in American life. Mainstream Democratic Party politicians, in other words, are beginning to take for granted that their constituents will embrace the more institutional understanding of racism. At the same time, between 2001 and 2018, the share of Democrats who describe themselves as liberal in Gallup polls has risen from 30 percent to 50 percent. 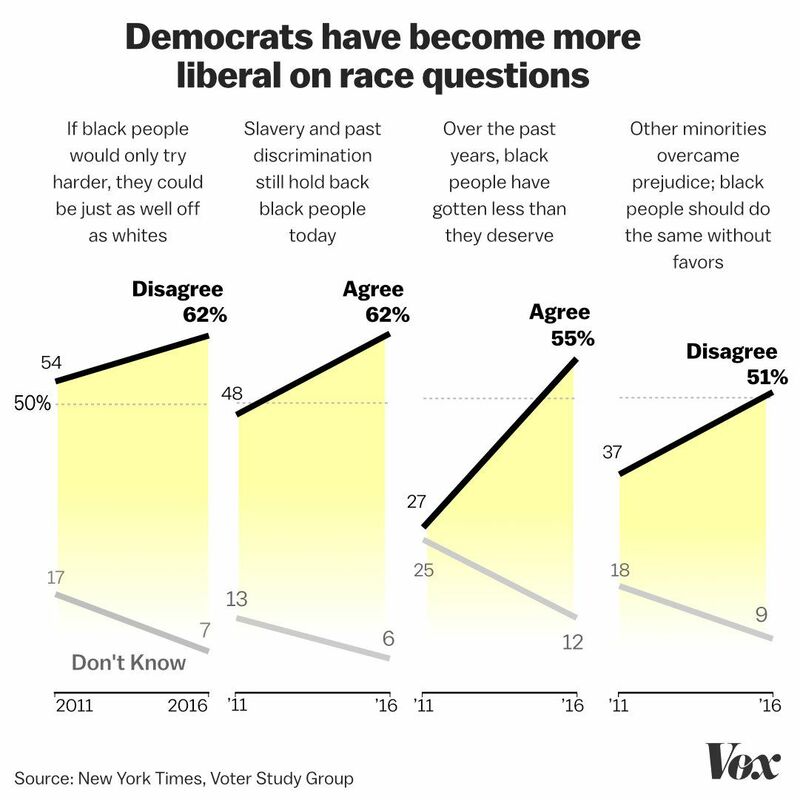 The upshot is that white liberals — a group whose views on race are generally to the left of nonwhites — are now about 40 percent of the overall Democratic Party, making them the largest bloc in the party and the critical driver of Democratic politicians’ leftward shift on race and identity issues. Back in 1996, the Democratic Party platform read like something out of a Trump campaign ad. “In 1992, our borders might as well not have existed,” the document states. “Drugs flowed freely. Illegal immigration was rampant. Criminal immigrants, deported after committing crimes in America, returned the very next day to commit crimes again.” Bill Clinton went on to run for reelection boasting about his crackdown at the border. 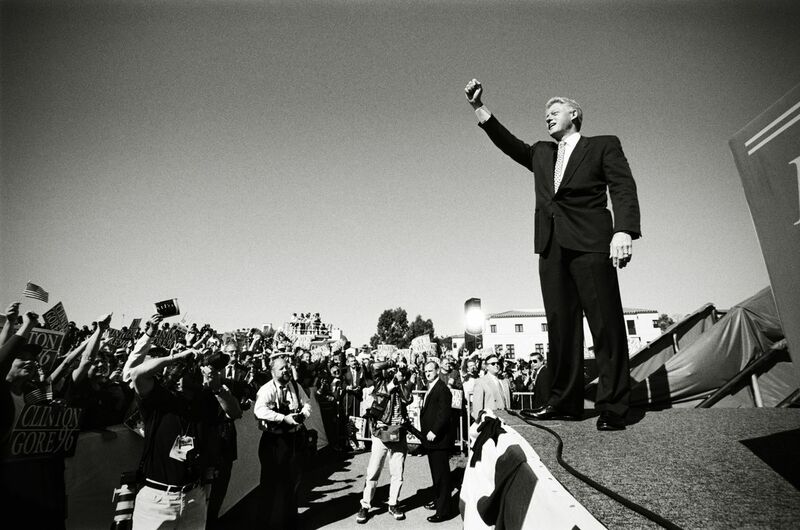 President Bill Clinton attends a campaign rally in Santa Barbara, California, during his reelection bid on November 1, 1996. 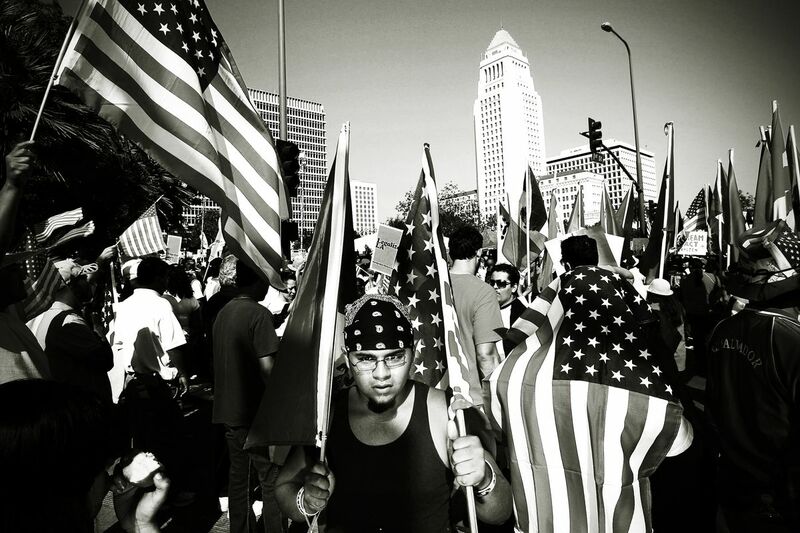 Demonstrators from three separate immigrants’ rights marches converge near City Hall on May 1, 2008, in Los Angeles. Perhaps the clearest sign of the shift, however, is the completely upturned politics of reparations. Ten years ago, reparations were a total nonstarter in Democratic Party circles. Instead, someone like Rush Limbaugh would try to secure political advantage by characterizing Obama administration economic policies as a form of reparations. Ta-Nehisi Coates’s 2014 article making the case for reparations was obviously enormously influential on the specifics of that question, but also more broadly in the larger Awokening — such that references to redlining and other discriminatory aspects of the post-World War II real estate market are now commonplace throughout progressive circles. Coates said that “initially I was very surprised” by the size of the white audience for his work — an audience whose existence is both a cause and a consequence of the Awokening — but he’s palpably changed the conversation. Now it’s Democrats themselves who embrace the term even when their actual policy proposal is race-blind. Kamala Harris, for example, mentioned her LIFT Act, which would boost incomes throughout the bottom 60 percent of the income distribution, as a form of “reparations” even though most of the beneficiaries would not be black. 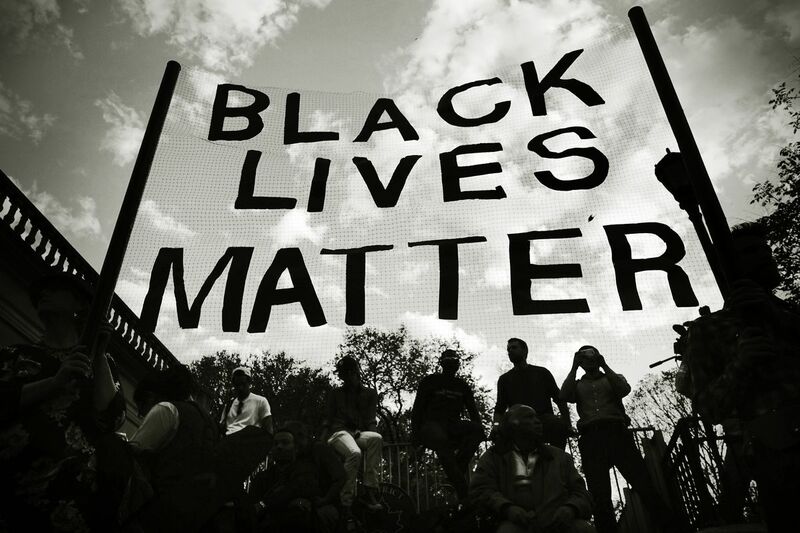 The leftward shifts on immigration, criminal justice, and reparations are often described as reflecting the electoral clout of nonwhite voters. But while that is surely part of the story, the underlying demographics simply haven’t changed rapidly enough to account for the pace of the change. 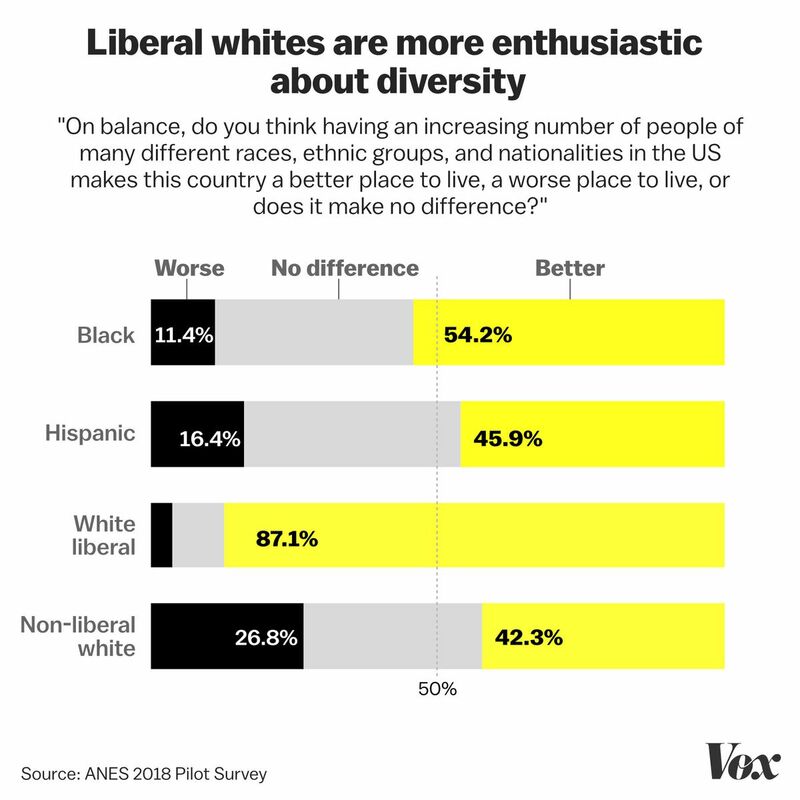 The key difference is that white liberals have changed their minds very rapidly, thus altering the political space in which Democratic Party politicians operate. 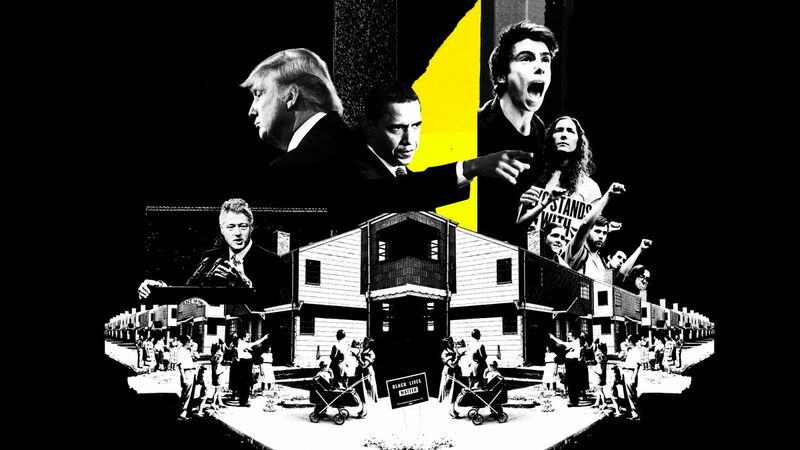 After all, say the racial resentment skeptics, the Obama-to-Trump flippers were, by definition, willing to vote for Barack Obama — so how racist could they possibly be? A key point to understanding this is that “racial resentment,” as used by political scientists, is a term of art that largely measures political views rather than any kind of interpersonal animosity. This is, in fact, a very revealing query in terms of your understanding of the history of race and ethnicity in the United States. 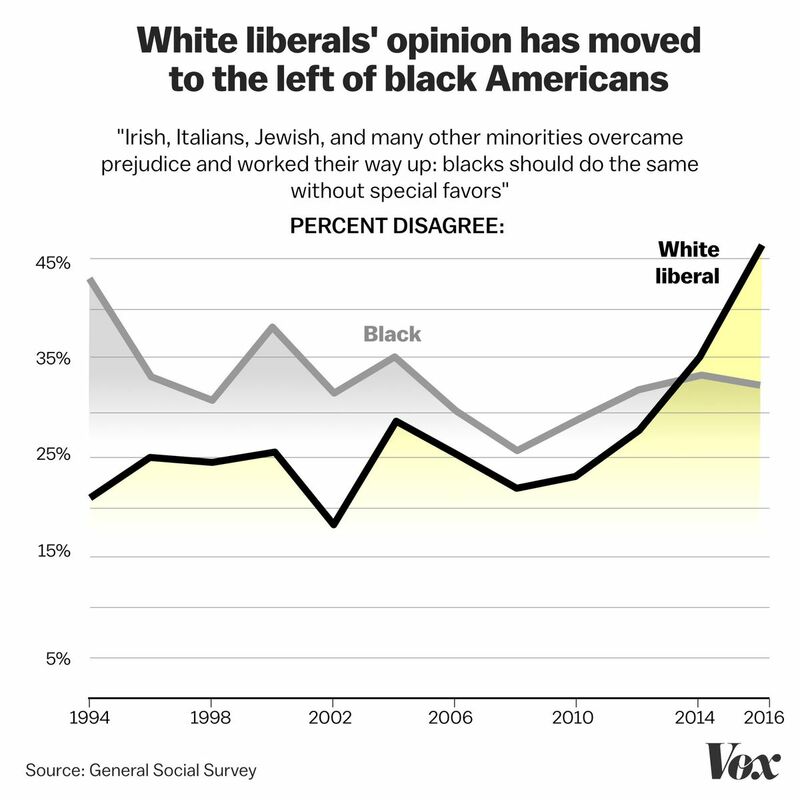 About a third of African Americans disagree with it, which is more than the share of the overall white public but substantially less than the 45 percent of white liberals who say they disagree. One of the signature consequences of the Great Awokening is the sense that Trump is a uniquely loathsome figure in American politics. To the extent that white liberals now see racism as an enormous looming challenge for the country in a way they did not in the relatively recent past, Trump is very much the personification of that challenge. And thus, given the perfect enemy, it’s perhaps not surprising that much of the newly woke attitude is, in crucial respects, a bit vague in its precise policy implications. Everyone is talking about reparations and “institutional racism,” but nobody has a precise policy program for tackling either of those things. Congress passed the prison reform bill, the First Step Act, but there’s little consensus on what the next step is. But it’s clear that getting rid of Trump is a key part of the story, and a key argument in the 2020 primary is over who is best suited to do that — a flashback candidate like Biden, someone like Harris or O’Rourke who’s more evocative of the future, or a leftist like Bernie Sanders or Elizabeth Warren. And yet to the extent that one believes — as, in fact, the evidence seems to say — that racial polarization of the electorate was a boon to Trump’s fortunes, it seems plausible that Democrats’ new post-Awokening political style will only help him win. But since anti-racism really is a central motivating force for the anti-Trump coalition, it hardly seems realistic or reasonable to expect it to hide that fact. Social upheavals simply do not abide by the dictates of partisan politics. The increased moral fervor unleashed by the Great Awakening of the 1840s and 1850s broke the Whig Party and temporarily entrenched the South’s hold on political power. But abolitionist sentiment carried the day in the end. 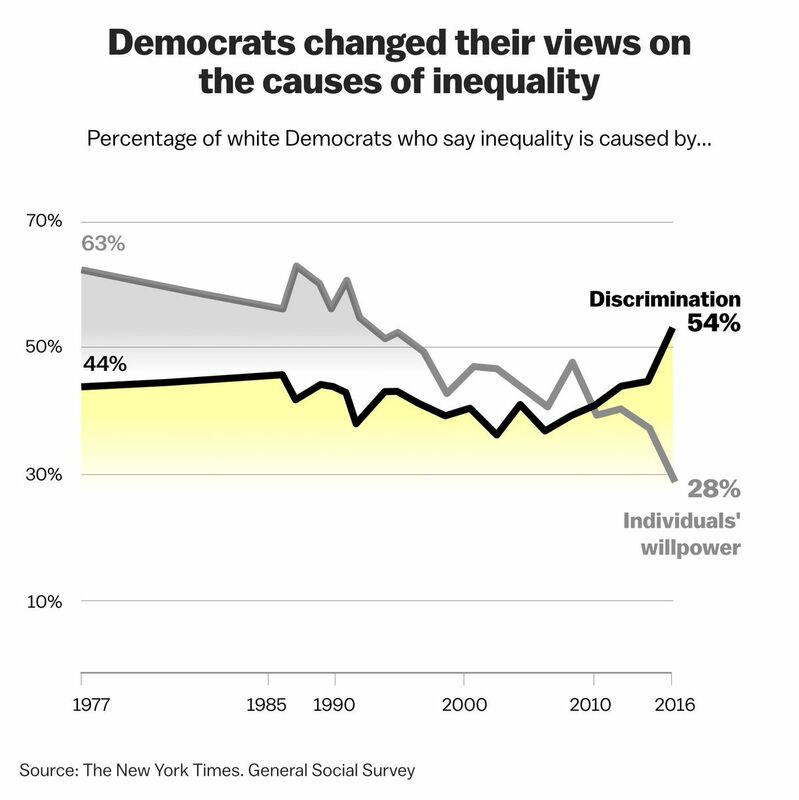 And by the same token, while the Great Awokening might drive some Democrats into Trump’s arms now, the sustained phenomenon is forcing the Democratic Party to confront the legacy of America’s racial caste system squarely. The next Democratic president will have to do the same. People in Union Square rally on April 29, 2015, in solidarity with demonstrators in Baltimore after the death of Freddie Gray.